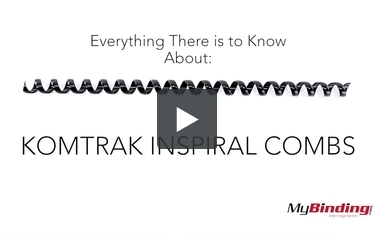 This is Everything There is to Know About Komtrak Inspiral Combs! First off, there are two types, Inspiral I and Inspiral II. This video will show you both. With the largest size of 38mm you can bind about 330 pages. And around 30 with the smallest 10mm size. It’s made to bind 19 hole punch patterns, which is normally used with plastic binding combs. With plastic combs you need a machine to bind you documents—but with Komtrak you can do it completely by hand. Simply twist the binding in all the way. Lay it on an edge so you can use both hands. Inspiral 1 comes with a clip you attach to the last two loops—and the other end is already bent for you. Inspiral 1 is also editable—easily add and remove pages as seen fit. A benefit to Komtrak Inspiral binding is that it lays flat, and an advantage it has over plastic combs is that it also lays back to back. Keep in mind that when you do this, it extrudes out the bottom about a centimeter. This binding functions very similarly to spiral coil, but it works with a 19 hole punch pattern.